Love cooking a roast chook? Dislike the cooking time? Spatchcock it! This is way easier than it sounds. A spatchcocked chicken, is basically a butterflied chicken. 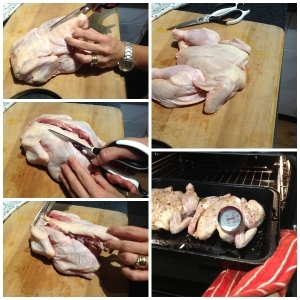 ‘All you have to do’ is remove the backbone of the chicken using kitchen scissors and then you push it out flat. Easy! Why bother? A roast chicken is such a simple and delicious dinner, you just can’t beat it for versatility or appealing to all kinds of eaters. Unfortunately, a roost chook takes too damned long to cook! I don’t know about you, but I’ve got places to be, people to talk to, books to read, makeup to apply! Simply put, spatchcocking a whole chook significantly reducing the cooking time. It’s as easy as! All you need is a pair of kitchen scissors (you could use a paring knife). On the topic of kitchen scissors, here’s an unpaid endorsement for Tupperware: I LOVE my Tupperware scissors, they are sturdy, stay sharp, dishwasher safe. They were totally an investment. First, turn the whole chicken breast side-down. Cut along one side of the backbone with your scissors. Cut along the other side. Trim off the excess fat. Flip it open, turn it up the other way, press down hard. Now it’s ready for the oven (or BBQ, or spit roast). I spatchcocked these chickens on a Sunday night ready for the week (I’m getting organised and have planned chicken salads for lunch and Asian Noodle Soup for a dinner on the run). Tonight we are having Hot Chicken Wraps with salad and Satay Sauce. Hmmmmm.